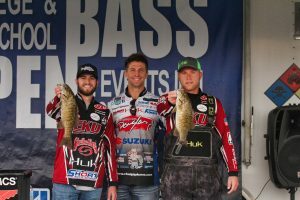 For the second year in a row, Chad Pipkens attended this one day bass fishing tournament for college and high school anglers. The event is put on by a fellow professional angler, Brandon Card, who also fishing on the Bassmaster Elite Series, and it is sponsored by Suzuki Motors. 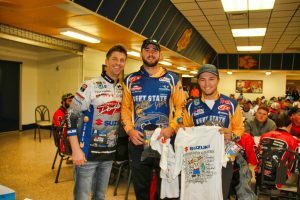 The event took place this year on Saturday, December 1st on Lake Norris in Knoxville, Kentucky, proceeding rules, registration, and dinner on Friday, where Chad Pipkens spoke to the young anglers about how he arrived to his current situation as a professional bass fisherman. Unlike the young fishermen and fisherwomen sitting in front of him, Pipkens did not have the opportunity to fish on a high school or a college team, as they did not exist at the time. The day of the tournament, Pipkens was involved with setting up the event and emceeing during the weigh in with Brandon Card. It was a typical 8 hour tournament, with the heaviest bag of five fish being the winners. College fishermen fished against college fishermen, and high school against high school. The event was a team tournament, therefore two anglers per boat (plus a boat driver for the high school teams), but the teams could only weigh in a total of five fish. It was a great turn out this year, with 105 high school teams and 45 college teams. The high school team that won was Campbell County High School, who won $1500 for first place. Bethel University won on the college side, with $2500 as the prize. 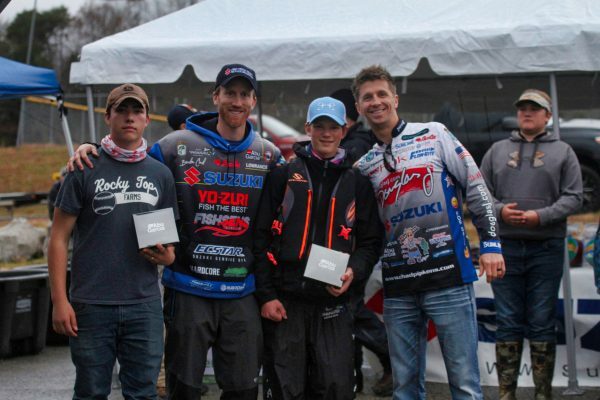 It was a fun event for both the young anglers and professionals, and it will be held again next year!